DVD main title refers to a file title that contains the main movie only. A DVD consists of many titles, up to 99 currently. Among them, some are ads, some are tidbits, and those - sharing the same playback time with the real main title - are designed to fool DVD ripping and copy software with the aim of preventing copyright infringement. Keeping main title only has many advantages, say, get rid of unwanted sections, save time to rip DVD and play DVD, save storage of your computer or other storage devices. However, copying main title is not as easy as you expect. 1. It's hard to pick out the true main title. Due to advanced encryption technology built in, the main title of a DVD is difficult to be detected by ordinary DVD rippers in the market. Thankfully, there're still a few tools that can single out the correct main title from copy-protected DVDs automatically, even from those with 99 DVD titles. WinX DVD Ripper Platinum is one of them. - Support both homemade and copy - protected DVDs. - Generally, it can detect the true main title automatically. - Rip main title quickly and easily without crash or other errors. 2. Even if you find it, you possibly encounter DVD main title copy crash problem. "Some time ago, I bought a few new DVDs, The Trust, I Am Wratch, The Perfect Match, and P90X3 (a workout DVD from BeachBody). For the purpose of easy management, I attempted to copy the main titles out of those DVDs. However, all DVD rippers I tried crashed when I used them to rip main title. And they worked well while dealing with other titles. What's going on? How to fix DVD main title copy crash problem?" Why Can't You Copy DVD Main Title Without Crash or Other Issues? It's common to meet crash issue while ripping commercial movies DVDs, workout DVDs and Japanese AV DVDs. One reason is that a commercial DVD is always locked with one or more encryption schemes, for example, CSS, region code, RCE, Sony ArccOS, UOPs, Disney X-project DRM. A special format embedded in DVDs is another. Some rippers may be able to overcome copy protection technologies, but can't get rid of the special format. 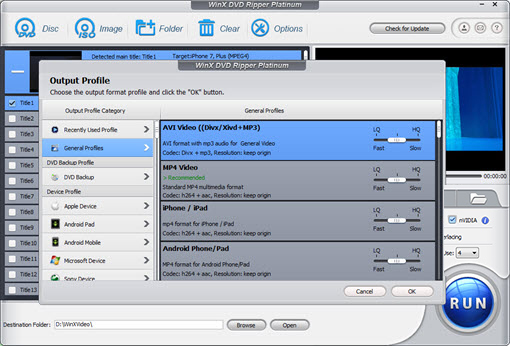 Fortunately, WinX DVD Ripper Platinum likely helps you fix DVD main title copy crash problem. This tool can remove all DVD copy protections and is said to conquer the special format soon. How to Rip/Copy DVD Main Title Successfully? Before any further, we should download and install WinX DVD Ripper Platinum or its Mac version onto computer. Even the latest operating system like Windows 10 and macOS Sierra is supported well. Now, follow these steps and copy DVD main title without crash. Step 1. Load target DVD. Insert DVD into DVD ROM and launch the ripper. Next, hit DVD Disc button located at the top left to select the DVD you just input. After step 1, the output profile panel will show up automatically. You just need to select one profile from the hundreds of choices based on your own needs. Step 3. Make some adjustments optionally. * Select main title: by default, this ripper will detect the correct main title automatically while loading a DVD. But if there's something wrong, you can modify it. * Edit DVD main title: hit Edit button, and then you can trim/crop/expand video, enable/disable subtitle, select subtitle track, select forced subtitle, add external subtitle, and adjust audio volume. * Set video audio parameters: tap the gear icon, then you can adjust resolution, bit rate, frame rate, etc. * Tick Safe Mode: you'd better tick Safe Mode when ripping Disney DVDs as well as other strictly encrypted DVDs to rip main title without crash or other errors. * Use High Quality Engine: this option will help deliver highest possible image quality. * Deinterlacing: change DVD interlaced scanning mode to progressive mode to improve the output video effect. * Select CPU Core Use: up to 8 cores are supported to boost the DVD main title ripping speed. * Define destination folder: browse and select the folder you want to save the main title to. Step 4. Begin ripping DVD main title. Finally, simply hit RUN to begin copying the DVD main title as a digital file without crash. With various advanced technologies bundled, it will finish DVD ripping at super fast speed. * The software developer only advocates copying DVDs for personal use and suggests referring to the DVD copyright laws in your countries before doing so. [Solved] Can't Rip Beachbody Insanity Workout DVDs or Others?